BRIDGETOWN, Barbados — The massive influx of sargassum seaweed to Caribbean waters, since 2011, has had a number of negative touch points on the fisheries value chain, resulting in a catastrophic hit to the livelihoods of Caribbean fisherfolk, particularly in the harvest sector. In spite of impressive demonstrations of adaptability and resilience by the fisheries sector, the impacts cannot be ignored, especially, given the role of fisheries in food security, employment, livelihoods and foreign exchange revenues. These impacts were discussed on November 21-22, 2018, on the occasion of the second annual Sargassum Symposium, hosted by the Food and Agriculture Organization (FAO) and the Centre for Resource Management and Environmental Studies (CERMES) at the University of the West Indies in Barbados. 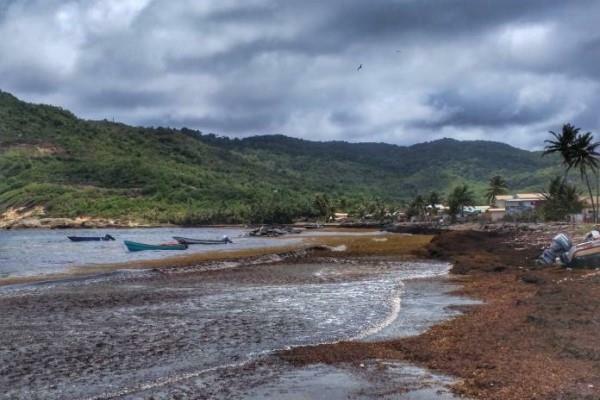 Much of CERMES' work on sargassum has been funded by the Climate Change Adaptation of the Eastern Caribbean Fisheries Sector Project (CC4FISH) of the FAO. In 2015, the number of Caribbean fishers from the 17 Caribbean Regional Fisheries Mechanism (CRFM) member countries directly involved in marine capture was estimated at 115,582 with an estimated 32,906 vessels and production levels of 141,574 metric tonnes per month. Caribbean exports of fish were valued at approximately US$263.7 million with the economic value of this sector accounting for up to eight percent of GDP in some CRFM member states. Quantity of catch has been impacted tremendously by the sargassum influxes. In the case of Barbados, the two main fish species, flyingfish and dolphinfish as well as wahoo, have been affected both in quantity and in fish size landed. According to Professor Hazel Oxenford and Dr Shelly-Ann Cox, the official landings records from the Barbados Fishery Division reveal a significant decreases in the average annual fish landings before the first sargassum influx of 2011 compared with the post-influx fish landings, with declines of -56 percent for flyingfish, -42 percent for dolphinfish and -50 percent for wahoo. In a study done by Farella et al. (2013) the authors explored reports that smaller sized dolphinfish were caught in sargassum event years, than other years. It was found that dolphinfish associated with sargassum were indeed smaller in size. The increase in number of juvenile fish that follow seaweed means that more juvenile fish are caught and less are available for replenishment of the stock and could potentially lead to unsustainability in the long term. A reduction in fish quantity landed can also cause an increase in fish prices, which often leads to a reduction in sales. Interviews conducted by Mitchell Lay of the Caribbean Network of Fisherfolk Organizations and CERMES' student Richeda Speede have shown how sargassum has directly impacted individual fishers from the perspective of access to fishing grounds, navigation, damage to vessels and gear and a need for adaptation. The dense sargassum patches are often so large that they are difficult to avoid and have been reported to impede the efficient function of boats and fishing equipment, often making it impossible to set and retrieve gear, and to navigate and the boat through clogged bays and harbours. Fishers are learning fast how to adapt using methods such as putting the vessel in reverse when sargassum gets wrapped around the propeller or switching off the engine to allow boats to drift out of the mire. Sargassum has caused extensive damage to boats due to propeller entanglement including power loss, blocked water intakes and resultant overheating and other issues. Most fisherfolk have also reported damage to fishing gear with the entangled, heavy sargassum causing breakage of nets and lines, and sinking of floating bouys. For example, longline fishers have difficulty retrieving their gear as the buoys disappear below the surface, weighted down by sargassum and their lines also break more easily because of the weight of the sargassum. Seine fishers' nets are also hard to pull in because of the weight of the sargassum trapped in the nets and even some shrimp trawlers in Suriname are losing catch because the nets fill with sargassum. Likewise, while sargassum gets caught in fish pots, preventing fish from going into the pots and increasing the need to frequently clean them. Spearfishers have also reported poor visibility, skin irritation and getting sargassum berries stuck in their ears. Fishers also report that some gear becomes much less effective when sargassum is present, such as trolling hook and lines (the weed gets stuck on hooks) and the fish attracting devices no longer work. Many fisherfolk have had to make investments in specialized gear, in order to effectively adapt to the challenges posed by sargassum. Barbadian longline fisher, Wayne Rose, has discussed the increase in practical protective measures he has had to take when hauling up the gear, so as not to be affected by skin irritation caused by sargassum or the small creatures that live within it. He reports covering himself in long sleeves, scarves, and sometimes even a snorkelling mask when hauling up his lines. Adaptation and innovation has been both positive and negative. Fishers are collaboratively working and warn other fishers about areas to avoid while radioing for assistance when stuck. Many use weather apps such as Windguru that monitor ocean temperature, wind speed and swell heights to help them predict the likely occurrence of sargassum. Innovative fishers have used wire lines or cable and lead sinkers to carry the line below the floating sargassum. Many fishers have used home-made strainers to protect their engines. When factoring the cost of extra maintenance and repair and fuel costs against reduced catch due to gear inefficiency, decreased fish size and declines in catch volume, the costs to fisherfolk have been extremely high. Supported by the CC4FISH project, CERMES is developing a 'Best Practices Guide for Fisherfolk' to share lessons learned by fishers to better adapt and cope with the influxes of sargassum and thus reduce losses. To date, many fisherfolk have reported having to borrow money to repair, maintain and replace fishing equipment and supplement lost income. Others have had to tighten their budgets or seek alternate employment – many fisherfolk have reported finding other jobs such as security guards, gas station attendants or in construction. In recent years, incidents associated with climate change have become more pronounced throughout the region – the sargassum problem is yet another part of a much larger picture. There is much work that needs to be done on improving data collection and reporting in order to determine the precise economic impacts, but it is clear that saragassum will result in changes in availability of fish, fishers' catch per unit of effort and the cost of inputs. This in turn will negatively affect food security, livelihood and employment in the fishery sector.